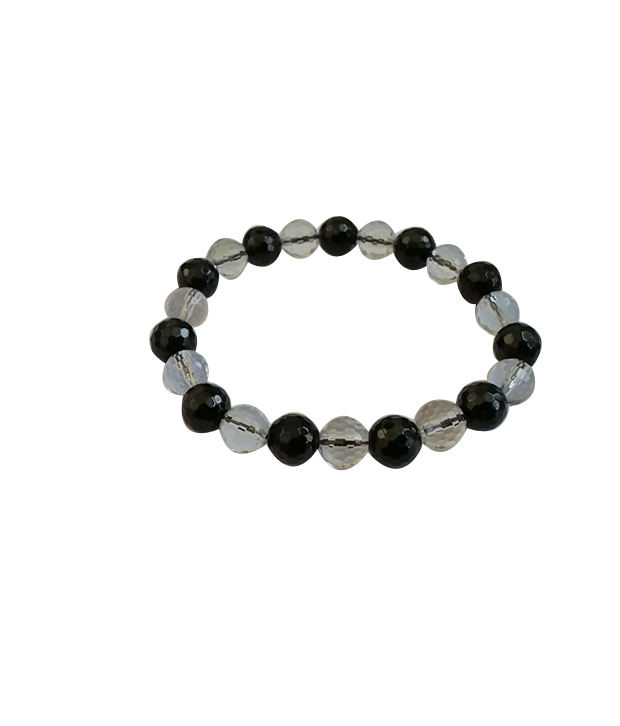 Kriti Feng Shui Black Tourmaline and Clear Quartz Combination Bracelet. These Energized Semiprecious Clear Quartz Crystal amplifies prayers, healing, thoughts, wishes and positive visualizations. It works on every level to bring the body into balance and boosts the immune system. It is believed to supply positive energy and help dispel negative energy and also help children achieve better concentration ,focus to attain academic success. Black Tourmaline cleanses, purifies, and transforms dense energy into a lighter vibration. Use Black Tourmaline to help with electromagnetic smog and increase physical vitality. Black Tourmaline is a fantastic stone for grounding and protection from spiritual fear ,phobia and aids in opening up the Root Chakra. Physically, Black Tourmaline is a purifying and detoxifying stone, helpful in cleansing the body. Together they make best combination for students ,scholars or for people who are at tough competitive environment in career path. Disclaimer: These Semi Precious stone/Beads are believed to bring about all the good things. We do not guarntee its success and are not responsible for any claims. Any person with a conditions requiring medical attension should consult a qualified practitioner or therapist. Product colour may slightly vary due to photographic lighting sources or your Screen settings.